The Cannondale Quick CX 4 hybrid bike rental on Maui. 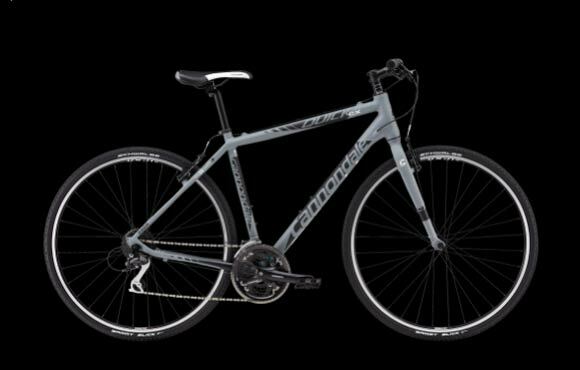 Got a cycling vacation on Maui planned and trying to figure out which bike to rent? Whether you are looking for a hybrid bike rental like the Cannondale Quick CX 4 pictured to the right, the best high performance road bike rental on Maui or a full suspension mountiain bike for the XTerra World Championships, West Maui Cycles Lahaina bike shop has you covered with our ever expanding bike rental fleet! More new rental bikes arrived and were added to the fleet of rental bicycles available at our West Maui bike shop in Lahaina. This time, we have a Cannondale Quick CX4 hybrid rental bike. All new Mountain Bike Inspired Frame - For 2013, the Quick CX gets an all-new lighter frame with more pronounced SAVE features and a smaller diameter 27.2 seatpost for a smoother ride. OverSized HeadTube - Junction Massive 1.5" Si headtube is connected to an oversized top tube and down tube for a level of steering precision and control usually found only on the World Cup Circuit. Custom Forks - For off-road control and on-road comfort, most Quick CXs are equipped with 50mm-travel, 1.5" steerer suspension forks, including the radically light and stiff HeadShok DL50. The Cannondale Quick C 4 Hybrid bike renal at West Maui Cycles in Lahaina.